On March 30, 1981, at 2:25 p.m., President Ronald Reagan was leaving the Washington Hilton through a side door after speaking to a union group. Outside was a gaggle of staff, secret service, reporters, and bystanders, including one determined to end Ronald Reagan’s life at that moment. As the president headed toward the car, a reporter barked out a question. With a smile, Reagan raised his left arm to deflect it. But he could not deflect what was about to fly in his direction. A few feet from the safety of the backseat of his presidential limo, Reagan heard what sounded like firecrackers. It was gunshots. Secret Service agent Jerry Parr thrust Reagan into the car, landing on top of him. “Jerry, get off,” cried Reagan, “I think you’ve broken one of my ribs.” Noticing the frothy blood bubbles emerging through Reagan’s lips, Parr commanded the driver to get to a hospital fast. They reached George Washington University Hospital in minutes. Only once Reagan was on the table did the doctors determine the terrible extent of the 40th president’s injury. John Hinckley had employed .22 Devastator bullets designed to explode on impact. One of the bullets had ricocheted off the armored car, flattened, and sliced into Reagan’s body through his left armpit—so tiny that surgeons only discovered it after finding a hole in the president’s jacket. The projectile traveled downward, bounced off a rib, punctured a lung, and finally halted in Reagan’s chest, less than an inch from his 70-year-old heart. The president lost a huge amount of blood and proceeded to survive a perilously close call. Of course, nearly all of this has been reported before. Never reported, however, was the unique reaction of Nancy Reagan. It was shared with me in February 2006 by Louis Evans, the longtime pastor of the National Presbyterian Church, who kept it to himself for 25 years. Knowing my work on Reagan’s religious faith, the aging Evans decided to share the story with me. The Reagans attended the National Presbyterian Church during their first weeks in Washington. Evans was their new pastor. The day after the assassination attempt, a distraught Nancy was in need of spiritual counseling. She asked Evans to track down Donn Moomaw, who for two decades had been the Reagans’ pastor at the Bel Air Presbyterian Church in California. Evans picked up Moomaw at the airport and brought him to the White House, where they were greeted by Mrs. Reagan in a room that included a small group of close friends: Frank Sinatra and his wife, the Rev. Billy Graham, and a Los Angeles businessman, the name of whom escaped Evans. Yes, Nancy had deep regrets: If only she had been next to Ronald Reagan as he strolled to that limousine, positioned between him and Hinckley’s pistol, she could have taken that bullet for him. Imagine that. It was a bracing thought to Evans then, and should be to us today. It was always understood that Nancy was Ronald Reagan’s supreme protector, the one who played bad cop and watched his back as he trusted everyone, regardless of their loyalty. Their son Ron once said that his dad trusted everyone and his mom trusted no one. Reagan left the White House with the highest approval ratings of any president since Eisenhower; she would never win a popularity contest. Nancy received a lot of bad press, not all of it undeserved. Yet, what Evans told me adds a heightened appreciation for Nancy’s commitment to her spouse. 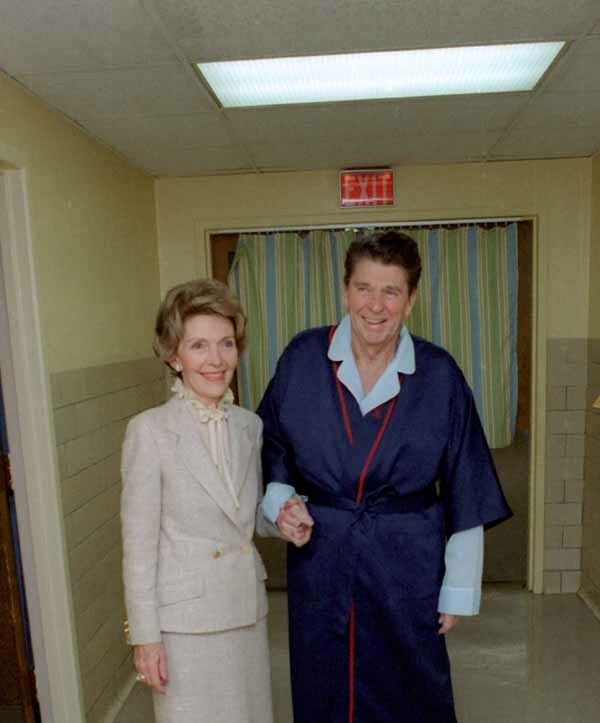 “Ronnie is my hero,” Nancy once glowed. “My life began when I got married. My life began with Ronnie.” She was willing to give that life for him. Nancy Reagan’s reaction to her husband’s shooting should be seared into our memories of this First Couple, regardless of political differences. It is an inspiring image of one woman’s undying devotion to her life partner—a woman who now at last is reunited with her Ronnie. –Dr. Paul Kengor is professor of political science and executive director of The Center for Vision & Values at Grove City College. His latest book is Takedown. His other books include 11 Principles of a Reagan Conservative, The Communist: Frank Marshall Davis, The Untold Story of Barack Obama’s Mentor and Dupes: How America’s Adversaries Have Manipulated Progressives for a Century. Editor’s note: This article first appeared at FoxNews.com.